A destination that has long been on my list for diving. I've always heard spectacular things about Cozumel, and have been anxious to see for myself. My sister-in-law asks if Maureen and I are interested in joining her for a one-week package diving trip there. How could I possibly decline? We fly to the island in the early afternoon of a July Monday. Our first impression is that Cozumel is a FURNACE this time of year. And we say this as people who have lived through a number of Florida summers. The island of Cozumel is 189 square miles in size and just east of the Yucatan Peninsula. Very flat and dry, with scrubby vegetation, a small number of tiny, unnoteworthy Mayan ruins, a heavy concentration of tourism, and colossal cruise ships on its western side. 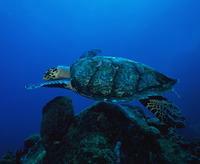 And packed with folks who know that there is really only one reason to visit Cozumel: world-class scuba diving. Despite our arrival after lunch on Monday, we realize we have plenty of time to squeeze in a few shore dives. We check in at our lodging for the week - Scuba Club Cozumel - and head for the Club Dive Shop to check out tanks. We learn that the Club provides many conveniences for divers. Plenty of easily-accessed dive lockers located next to a good number of fresh water baths for rinsing gear after dives. Our room, the dive shop, the Club restaurant, and the lockers are an easy, short walk to both a shore dive entry and the pier where the Club dive boats pick up divers each morning. Our first shore dive quickly confirms what we have heard. Cozumel has impressive visibility - even on shore dives. 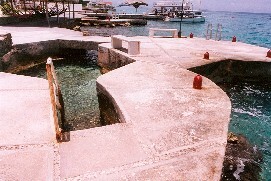 We also discover that the shore dive in front of the Club contains a number of hollow concrete igloos perforated with portholes. I was unable to confirm this, but I'm nearly certain that these structures were part of the "Eternal Reefs" program I've recently learned about, where one can have his or her cremated remains incorporated into a concrete monument that is placed in a marine environment to establish artificial reefs. We notice that the tropical fish seem to enjoy the structures. The water is warmer than any dive waters I have done in the past. Bath water. In our first shore dive, I spot a good number of moray eels, skates, a good number of schools of siren fish, starfish, and a large number of jet-black sea urchins (which I get an immediate introduction to as I start our first shore dive and mistakenly use my hand, without looking, to keep myself from being bashed against a rock wall - a painful introduction...). Later on, in our twilight shore dive, we also see a number of sea cucumbers, a snake eel, sand rays, and parrot fish. Shore diving in front of the Club, like most diving at Cozumel, is drift diving, as there is a noticeable current moving from south to north on the west coast. Day Two, and I'm already blundering due to my forgetfulness. As the diveboat - the Coral Diver - heads out to our first boat dive destination at 8:45 am, I realize that I have forgotten my wetsuit. A fortunate blunder, however, as my mistake has me realize that the waters are comfortably warm without a suit. Indeed, it is my first dive without wearing a suit or even a shirt, and I discover that I feel more free and less burdened, as my wetsuit tends to be an ordeal to squeeze into and out of for dives. I make a mental note to do more suit-free diving in the future. Our second dive is Tormentos Reef. Rather average with regard to reefs. 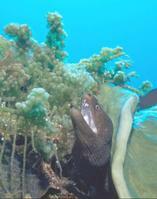 But we quickly come upon the most enormous moray eel I have ever seen. 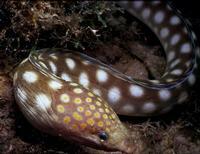 The eel is lying under a coral rock ledge, is about 8 feet long and as thick as a telephone pole. We also spot octopus along the way. Suddenly, I discover that Cozumel does not only grow large eel. I come upon what is certainly the most gigantic grouper fish I've ever seen. Almost the size of a small car. That afternoon, our dive boat takes us to the extremely popular Cozumel wreck dive. The C-53 Felipe Xicotencatl is a mine-sweeper that was sunk in 2000. It is 184 feet long, 33 feet wide, and was built in Tampa FL under the name "Scuffle". Donated to the government of Mexico in 1962, the ship was then used as a gun boat, a patrol for illegal arms and drugs, a search and rescue ship, a troop transport and eventually as a training vessel for cadets of a naval academy. After 55 years of service, the ship was retired in 1999. The boat sits upright on a sandy bottom 80 feet from the surface. It is a large, ghostly ship. For about 30 minutes, after we pop into it from a deck portal, we swim through a narrow labyrinth of passages inside the ship. Somewhat disconcerting for me, as I've never dove inside a ship for more than a few minutes, nor have I ever been in such a confined set of ship passages. "Stay calm, Dom. You're safe." I repeat this to myself throughout the ship. Will I panic? Will I be overwhelmed by claustrophobia? What if I panic and cannot find a portal out of the ship? Will I have time to get to the surface if there is an "out-of-air" situation? Fortunately, I successfully suppress these fears of events that are extremely unlikely. I settle down and enjoy the wonderful views of the ship innards, aided by the great visibility and the many portals allowing sunlight to stream in. Appropriately, this mine-sweeper contains schools of small glassy SWEEPER fish. I recommend the Xiotencatl wreck as a relatively easy, enjoyable wreck dive. Even for scaredy cats like me. 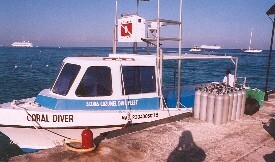 On Wednesday morning, the Coral Diver ships us to Santa Rosa reef, another famed Cozumel dive. It's hard for me to believe, but Santa Rosa has wall diving and swim-throughs that are, in many ways, even more impressive than Palancar. Santa Rosa features a tight, human-scaled sequence of swim-through tunnels. Again, the visibility is mind-blowing. And again, the grouper are huge (one awaits us at the end of an incredibly beautiful swim-through). Perhaps the most remarkable aspect of the Santa Rosa swim-throughs is this. We would swim through an astonishingly colorful and lengthy tunnel and abruptly come upon the Santa Rosa Wall, which meant swimming out of the tunnel, looking down, and suddenly seeing a seemingly bottomless abyss dropping thousands of feet below me. The wall diving here was, by far, the most comfortable, relaxing wall dive I have ever done. We are able to simply let the ocean current carry us along, as we serenely face the wall in an upright posture for several minutes. The feeling of effortless weightlessness is outstanding. Our second dive is Villa Blanca reef. Strong current. Colorful sponges and coral. Along the way, I'm treated to encounters with tiger grouper, black grouper, trigger fish, puffer fish, moray eels, trumpet fish, and snapper. On Thursday, the Coral Diver brings us to Colombia Reef. Again, I'm shocked by the superb, memorably long, winding, and confined swim-through tunnels. Here we are treated to large sea turtles and bright, bright colors. On the way to Colombia, I discovered that there is one thing that I've left in Cozumel that I'll never be getting back. As far as I can speculate, my gold wedding ring is now inside the stomach of a Cozumel grouper. I noticed the ring missing while I was checking out my dive gear during the morning dive boat ride, and am guessing that it fell off during a dive the day before. I feel awful about it, but am comforted to know that at least I've left it in a memorable dive location, instead of, say, a strip commercial parking lot in New Jersey. Lesson learned for a guy who is not used to wearing jewelry. Don't wear rings while diving. Yucab reef - which we dive after Colombia - features quite a large number of ocean trigger fish. We are also treated to a large number of so-called "splendid" toadfish, which apparently enjoy hanging out under large rocks with their whiskers poking out menacingly. Again, we spot large grouper and a good many lobster. Overall, we come upon an amazing population of sea life at Yucab. But the very strong current along the reef on this day means that we must look QUICKLY at the creatures, as we fly past at a rapid speed. It is our final shore night dive in Cozumel (see shore entrance at lower right). Me, Maureen, and my sister-in-law Carol. We are a bit rushed, as Maureen is hoping to be back in time for the "last call" for the delicious ice cream that the Club restaurant serves. The 3 of us set out. The 2 women stop for several minutes to investigate a rock pile teeming with all kinds of interesting Cozumel creatures - their flashlights blazing into the many crevasses within the pile. I lose my patience, and set out on my own, but Maureen's frantically waving dive light (a signal to other divers during a night dive that there is something to see) calls me back. I look under the large, coral-encrusted rock to see 2 large, bulging eyes looking out at me. It looks like a yellow-orange blob. What is it? Maureen quickly gives me the diver hand signal for "octopus." Of course! Back on course, we are confronted with an ocean current that is noticeably stronger than it has been on our previous shore dives here. I battle mightily, expending a great deal of energy just to swim a few feet. Maureen again signals me frantically. Later, I spot a large moray eel. Then, while inspecting a large coral reef wall, I find myself trapped by a well-known diver dread: fishing line. It is my first time, in over 100 dives, being caught in fishing line. It also happens to be the first time in all those dive outings that I'm not carrying my dive knife - which is primarily carried by divers in the event of getting caught in a line. Why I am without my knife? Because on my first boat dive in Cozumel, my otherwise quality dive master instructs me to not use my dive knife in Cozumel, as the diving is within a national park where fishing is not allowed (and therefore, no fishing lines are expected in the reefs). Not carrying the knife is a way for Cozumel to minimize the likelihood of divers using a knife to harm sea life or coral. I protest to the dive master, jokingly saying I need the knife to fight off man-eating sharks that are sure to track me down. But in this case, I am now kicking myself for my awful misfortune. As dive books instruct, it is rather easy to become totally enmeshed in line. The more a diver struggles to be free of the line, the more tenaciously the line gets tangled around the diver. Fortunately, even though I now have hundreds of feet of 100-lb test line caught in my hoses, my BC and my fins, we are only about 20 feet down, so the line becomes more of an amusing annoyance than the terrifying specter it would have been had I been, say, 90 feet down within a ship wreck (as I was the a few days before). Finally, after Maureen frees me with her knife (she was not "caught" by the dive master), her sister Carol gets caught in it! WE FIND OURSELVES WITHIN A GRADE B HORROR FILM! IT IS THE FISHING LINE FROM THE GREEN LAGOON!! As it turns out, after much cutting and gathering, we surface from the dive with what seems like about 7 miles of heavy-duty fishing line and promptly inform the dive shop that their pier should be checked for more dangers lurking below for unsuspecting shore divers. On our last day of diving, the dive master suggests Palancar Gardens as our Cozumel Grande Finale. The Gardens are aptly named and an appropriate finale, as this reef contains a fantastic assortment of colorful, garden-like soft coral sponges and tropical fish. Along the way, we find large lobster. The reef contains a delightful number of fabulous swim-through tunnels and canyons. It was magical, these swim-throughs in the Gardens. The final Cozumel dive for us is Paso del Cedral. This reef also holds a surprise that I am not expecting. Despite its shallow depth, we float through a surprising number of swim-through tunnels. Again, we are stunned to come across what appears to be an 800-pound grouper, several toad fish, and a barracuda that appears to be the size of a freight train. Overall, we saw very few barracuda and NO sharks at all. The visibility during our week of diving was an out-of-this-world average of 120 to 150 feet (very much like the crystal clear spring water we are used to diving in Florida). 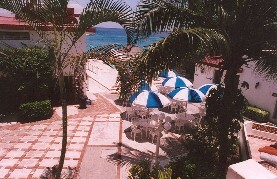 Scuba Club Cozumel is a club I recommend for Cozumel divers. In addition to the convenient services and facilities, we found the rooms to be comfortable and adapted to wet dive gear. The dining is very casual, and one can therefore feel quite comfortable going to dinner at the Club restaurant dressed in a grubby t-shirt and torn up shorts. Be forewarned, however, that tipping will be an eye-opener. At least it was for me. I was unprepared for the fact that the maid, restaurant staff, bellhops, boat crew and dive master ALL expect to be paid relatively hefty tips. Apparently, such a state of affairs is based upon what I presume are low wages paid to such staff. Divers must wait at least 24 hours after a last dive before flying, so we have all of Friday afternoon and Saturday morning to explore Cozumel topside. Rather than bore myself to tears in the Club room, I decide to ignore the strong advice from Carol that I NOT rent a motor scooter to see the island. "They're too dangerous," she says with an air of confidence and alarm. "People drive crazily in Cozumel and you'll be rammed even if YOU drive safely." I've heard this all before, and promptly ignore the warning. But I am disappointed that Maureen HEEDS this nervously-nelly, fun-killing advice. After haggling a bit on the rental price (I am proud to say that I saved many, many pesos by talking my way out of paying the sales tax...), I gingerly board the scooter with my ill-fitting safety helmet. I humiliate myself in front of the smirking rental scooter staff, as I've never ridden any sort of motorcycle, not even a motor scooter (even in my reckless youth). Like a dork, I get assurance that the scooter has no gears for me to try to learn how to use. I'm shown how to accelerate, brake, and push the scooter off its kickstand. Warily...awkwardly...I rotate my right handgrip, not sure of what would happen. The scooter scoots forward. No turning back now. In front of me is a frantic, chaotic scene of crazed Cozumelians negotiating streets and vendor stalls in every direction. I cautiously brake every 3 feet just to assure myself that I know how to stop the vehicle. Satisfied the machine can be halted, I am next confronted with the fact that I don't know what Mexican stop signs look like, nor whether I'll be harangued mercilessly by experienced drivers behind me. Fortunately, the north-south route I take south has no traffic signals or stop signs, so that terrifying thought subsides. My confidence grows. I pass a number of seemingly exclusive, "guests only" resorts on the southwest coast. I stop at a beach entrance and decline to enter due to the fee required. I get back to the scooter and realize, to my horror, that I don't know how to re-start the scooter. After 15 sweaty minutes, I begin to wonder if another scooter operator in the parking lot will help show me what to do, or how much it will cost to have my scooter hauled back to the rental place. Miraculously, I manage to start it, and I'm back on the highway heading south, with the cooling breeze blowing through my hair. So THIS is what it means when I see Harley riders with black leather biker jackets reading "Live to Ride. Ride to Live." I pass by long stretches of gorgeous waters and nearly deserted sugar white beaches on the south side of the island. The scooter and the speed limit signs inform one that the maximum speed is 60 KPH. Ordinarily, I drive over the posted limit, but in this case my inexperience and the bumpy Cozumel highway surface keep me feeling less than comfortable over 65 KPH. 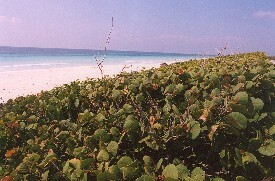 The south portion of the island, despite the fabulous beaches, is nearly uninhabited. Almost no vehicles or buildings. Just open road and incredible vistas. Again, I feel deep regret that Maureen is not with me. The history of Cozumel island is fascinating. During the period of the Mayan civilization, starting in 300 AD, the island was considered sacred and each Mayan woman on the mainland was obligated to visit the island at least once in her lifetime by canoe. Early in the 16th Century, Spaniards Geronimo de Aguilar and Gonzales Guerrera were shipwrecked on the island, were captured by Juan de Grijalva and made slaves until they were accepted by the Mayans. Hernan Cortes, the well-known Spanish explorer, sailed to the island, where Aguilar happily boarded the ship. However, Guerrera, who had since married a Mayan woman and had children with her, refused to leave. Aguilar joined forces with Cortes and used his knowledge of the Mayan civilization to help defeat them. Guerrera sided with the Mayans, and died defending them against the Spanish invaders. As a result, he became a hero of the Mayans. By 1600, the Mayans had been wiped out by massacre and disease, and the island became uninhabited. In the late 17th Century, the island was besieged by pirates. Shockingly, as recently as World War II, the US Army had a base on the island and dismantled some of the larger Mayan ruins on the island. Jacques Cousteau made the island famous for diving with his 1961 TV documentary about the reefs he had found there. There are now more than 100 world-class dive sites ringing the island.